The clocks moved forward last Sunday, meaning that finally the days are getting longer and spring is here. If you’ve got little ones though, their bed time routine may have just become more challenging as you now need to manage tired toddlers and a room flooding with light at the end of the day. At The Shutter Shop, we have the perfect solution that could help you all get a better night's sleep: blackout blinds! One of our most popular shutter styles for children’s rooms is the integrated combination of honeycomb darkening blinds and plantation shutters. This solution ensures maximum black out and minimal noise to the room at any time of the day. Even with such a wide variety on the marketplace, many so-called blackout blinds still allow small levels of light into any bedroom, and therefore they are not totally blackout blinds at all! Our solution allows to virtually eliminate any light bleeds from the sides. This is what we call real blackout! For young children, who need to nap in the day, as well as night or shift workers who need to rest at various times, having even a fraction of light can be a real issue. And don’t just take our word for it, some of most renowned sleep specialists rate a darkened room as one of the most crucial factors in ensuring children and adults get the best night’s sleep. Have you ever wondered why you sleep better in a dark room? The answer is in the way our body works. When there is a lower amount of light, the brain starts producing Melatonin, a hormone that helps regulate the natural sleep and wake cycle. During the summer months, melatonin secretion is naturally less, therefore it becomes much more important to make sure that the room we sleep in is dark enough. Not only our sleep will benefit, but also our whole general well being. Our manufacturers have developed an integrated combination of stylish plantation shutters and PURE Cell Honeycomb Blackout Blinds. Unlike traditional roller blinds, blackout roller blinds or curtains, our room darkening blind sits snugly in its own channel behind the shutters. This manufacturing solution helps stopping almost all light from seeping in. The shutter’s frame overlaps the blind, allowing a darker room and a better night's sleep. 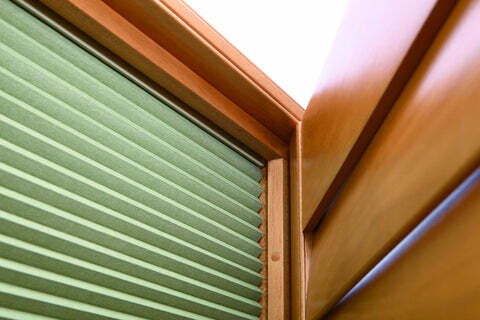 Integrated shutter and darkening blinds can also reduce the amount of noise that filters into a room. Also, it restricts visibility of the room to anyone on the outside where privacy is required. The pocketed, honeycomb design of our darkening blinds makes them perfect for trapping air and help add thermal insulation. This feature is in addition to the foil lining which blocks out the sun or streetlights. For a better night's sleep, this is really a great product for your windows. The delivery time is the same as our shutter orders, between 6 and 8 weeks. For more information about our integrated shutter and darkening blinds, contact us or send a survey request so we can visit your home and measure your windows. Our measure and fit service will give you full peace of mind and will ensure a perfect final result. Our surveyors will also help you choosing the perfect shutters and colour to match the style of your home.